So here's a bizarre, not so nice, coincidence. I had planned to write about how life gets in the way of writing. Looking for work, being a governor, and having kids all get in the way of finding time to write. Worrying about money because I'm still looking for work prevents me from zoning out and creating my story. So here I am at the keyboard thinking about how things get in the way when Jeff rings. "Don't panic, but Joe's flipped the car". Sorry? Don't panic? Seriously? And suddenly, instead of having the half hour put by to write my post I am a Mother worrying about her boy. BTW, he's 21, when do I stop worrying? Never? Thought so. Calls to him, my step-mum (remember he's living down there atm), Jeff and the half hour has fluttered by like all the other half hours I try to scurry away but always end up being clawed back because of other events. Oh, if you're wondering, the car is a complete write off, but at least he's okay and no-one else was involved :) Shame Jeff spend all Saturday afternoon under it changing his brakes - or maybe, it turned out to be a blessing and it could have been much worse if he hadn't. We never stop worrying about our children whatever age they are. I worry because two of mine have cut me out of their life without telling me why. It hurts but until I know can't do nowt about it. I don't have my own kids but I find myself worrying about my 3 stepkids a lot (even though they are 20, 22 and 24). Your dad lives in Italy? that can't be too rough to get to hang out there!!! Oh my gosh, so glad he is ok. Don't think we ever stop worrying about them, it's called being a mum! Wow, I'm glad he's okay. Things like that I did not think to include in my post about real life getting in the way of writing. Thanks for stopping by my blog. I wish you luck finding writing time. Glad no one got hurt...yikes! 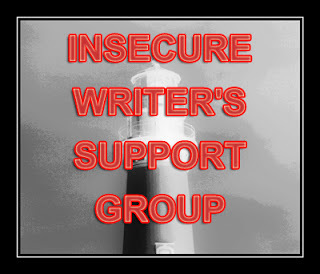 Yup, my IWSG post is about being fragmented....we all face it from time to time. My writing spot? The local McDonald's - no home interruptions. LOL! Glad your son is ok. How on earth did he manage to flip the car? Good luck on the terrace in Italy. It sounds lush, and hopefully there will be no distractions.